The high-speed Amtrak train that recently suffered derailment near DuPont resulted in the death of three people and sent dozens injured the hospital. The train was moving at a speed 50 mph faster than the design speed around a curve at the point of its derailment. Although excessive speed appears to have precipitated the accident, an investigation is ongoing to search for the reason. The National Transportation Safety Board (NTSB) investigation is expected to take seven to 10 days from the time of the crash which occurred on December 19, 2017. The NTSB will gather evidence and factual information at the scene, perform an analysis of the information and make a determination of probable cause, followed by recommendations. The Federal Railroad Administration (FRA) issues a yearly report on train incidents in the United States. Across the nation in 2017 there were more than 1200 train incidents between January and September. In the same year, Washington state alone was home to 24 train accidents. 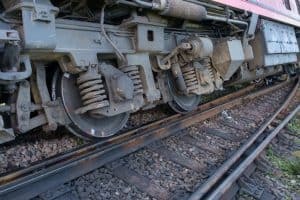 Most train accidents actually occur at railroad crossings. In 2016, there were more than 2000 train accidents were reported, causing 265 deaths and 798 injuries. Despite the statistics, train travel, as with air travel, is much safer mile for mile than traveling by car. That safety is contingent upon keeping the trains on the tracks, properly maintaining the tracks, and keeping the tracks free from debris. As well, it also depends on minimizing operator error and having backup systems in place to automatically reduce speed if operator error occurs. The investigation concerning the Amtrak fatal crash near Tacoma, WA is examining the possibility of something distracting the engineer, like another person in the cab, a cell phone, or another source. The person in charge of the NTSB’s investigation has received information from the event data recorder on the rear locomotor that indicated the train was traveling approximately 80 mph in a 30 mph zone. Investigators will compare those results with data obtained from the cameras and recorder from the front locomotor. The NTSB stated that the cameras in the engineer’s cab were badly damaged. There was one camera facing forward and another one in Ward toward the direction of person operating the train. These devices have been sent to the NTSB’s laboratory in Washington DC for analysis. Investigators will attempt to obtain images that reveal what occurred in the moments prior to the tragedy. It is standard procedure to test the crews of a train derailment for the presence of alcohol or drugs. A particular fact that has come to light thus far is that the train’s emergency brake system went into operation automatically when the train began to derail. It was not initiated by a member of the crew. What about positive train control technology? A positive train control system that possibly could have prevented the train from exceeding the designated design speed was absent from use for this portion of track. The crash of a commuter train in Los Angeles some nine years earlier in 2008 which took the lives of 25 people motivated Congress to mandate railroads implement this system referred to as positive train control. The system automatically slows or stops a train moving it to high rate of speed for design conditions or is in danger of hitting another train or running a red light. Originally, the law established 2015 as the deadline to implement positive train control. However, lobbying efforts by railroads influenced Congress to postpone the mandate. As of now, the technology must be installed and operational by 2018. Washington state already has parts of the system in place, but it is still undergoing testing. Don’t hesitate to contact seasoned Los Angeles transit injury attorney if you suffered some form of injury in a transit accident. At Taylor & Ring, we can help you retain vital evidence about your case, locate key witnesses can bolster your claim and fight on your behalf for compensation your own. We have a successful track record of winning verdicts and settlements in a wide array of cases for our clients. To schedule a free consultation, call us today at 310-776-6390 or send us an email through our contact form.